» Do Career Coaches Offer Guidance or Advice? Ever have a friend ask you for advice about work or relationships or even something as specific as which dentist to go to? Have you ever asked a friend or anyone for advice or guidance? Advice is a common commodity; sometimes wonderful, other times unasked for and unwelcome. 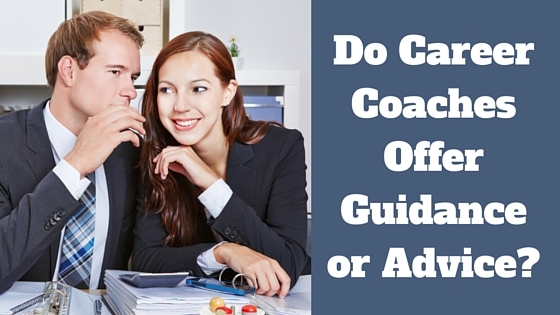 But when it comes to professional career coaches, do you expect them to give you advice? Do you want a coach to tell you directly what you should do for your career or which job to take? Or do you want guidance about how you might proceed or look at your situation, but not direct advice? Or maybe you only want them to help you explore your own thinking neutrally, without offering any directions forward at all? Maybe you want all of the above, but for different parts of your career and job exploration. I find my clients usually contact me by first seeking guidance and on some topics, advice: “I’m thinking about a career shift and would like some guidance” one person wrote me this week and a subject line for another email this week: “Career guidance and resume advice.” Nobody ever contacts me first asking if I can ask them some good questions and listen to them. They want that, but it’s not the motivating factor. So, the short answer is: Both. A career coach will provide guidance and advice. Sometimes guidance is required, which other times advice is better. Let’s take a look at the pros and cons of both guidance and advice and when one may work better than the other. Whatever their approach, I’d say coaches are always offering guidance whether they like the term or not. Even career or personality assessments are ways of offering guidance and advice based on what the coach thinks makes most sense for the client, with the coach guiding the client to the particular assessments they favor and then working with the client to interpret and apply the results. The real question may not be whether coaches offer guidance or advice, but when and under what circumstances? And how is it different form everyday advice, such as your friend advising you about much you’d love becoming a real estate agent like her? So what kind of guidance do career coaches offer? They offer guidance on career development, career change and choices, job search, networking, interviewing, and many other topics—including self understanding and discovery. They are not typically the topic experts in the fields you may want to explore, such as sales or management or engineering. Instead, they are the process experts, offering a way through the labyrinth of career and job search and job development options. But in some areas, direct advice can be very appropriate—such as in what goes at the top of a resume or what are some more ways to network or how to approach a job interview based on what the research says about how decisions are made. I worked with a client on branding herself for her job search. I asked her a series of questions and discussed the answers to guide her through her confusion about what her brand might be, as she had a laundry list of possible things she might say. She came up with her own clear advantages that created a story, a picture of her talents, that would be powerful and memorable. That clear brand informed every part of her networking and job search. Her homework was to include the key points on her resume (esp highlights of qualifications at the top), LinkedIn, and especially in answering the ubiquitous “tell me about yourself” information interview and job interview question. Is that work we did together an example of guidance? I’d say so. But not advice. We also looked at her resume, and I suggested specific things to change or revise. Is that advice? Probably. But she still had to go back and work out the details. When I recommended a time productivity system to another client struggling to tackle his long-term priorities, I was advising he at least try it. With another client who was searching for a new, more meaningful and fulfilling career, I explained my 4-step process and gave them specific creative activities to do to start with step one. To me, that’s certainly the key to the guidance I offer, but it’s not about advice. Finding a career is not something for advice, but for exploring through processes. Most clients need help discovering limiting beliefs that stop them from moving ahead in their. More guidance. Finally, remember when I suggested that your friend’s help is different than the help provided by an experienced career or job search coach? What makes coaching different from simply getting advice from a friend or peer? Coaches are trained professionals that have experience with offering career guidance. If that means asking you questions and just listening as you discover for yourself, great. If that means a specific idea on how to be more productive or get rid of that objective statement on your resume, that can be appropriate as well. So when your friend tells you that you ought to become a real estate agent, that may be the best idea you’ve ever heard, but it’s not the same approach as exploring your own career in a creative, systematic way and staying on track with a practical path to achieve whatever your heart truly desires. Working in partnership, that’s what the best coaching provides. Thinking of hiring a career coach to help you further develop your career? Browse our directory of career coaches and get a FREE consultation or request a personalized coach recommendation!